Beans and rice and everything spice. That’s what Mexican food is made of. 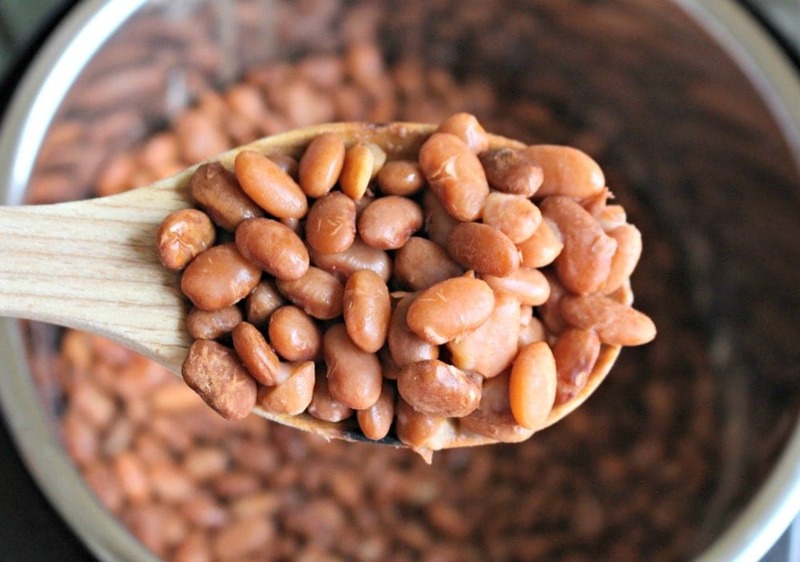 By making these Instant Pot Pinto Beans NO SOAK, you save time without sacrificing taste. Love it! Each week, I make a big pot of beans. 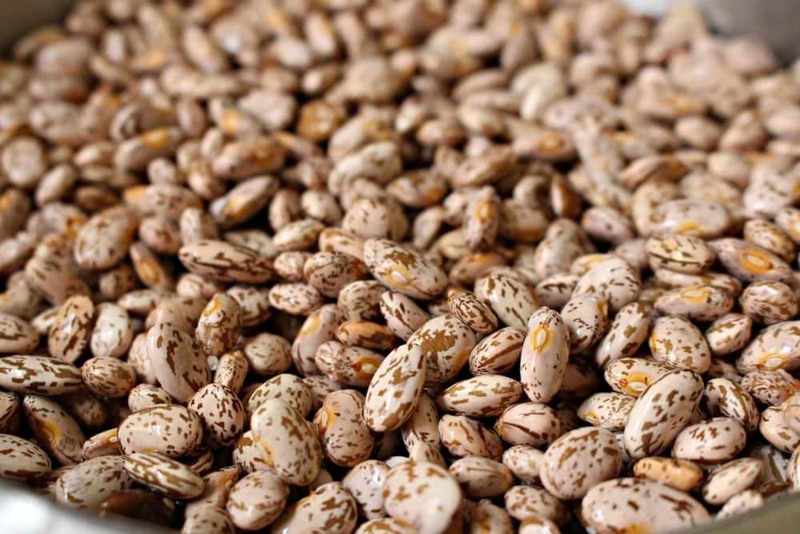 Frijoles de la Olla is a staple in Mexican food. I can make several dishes with beans, or just eat them as a side dish. Heck, I will even eat a bowl of beans for lunch. 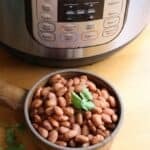 When I got my Instant Pot, the first thing I tried to make was Instant Pot Pinto Beans. My friends, you’re going to love this recipe! It starts off the same as regular Frijoles de la Olla. Sort the beans. Remove any broken pieces. Any partial pieces. Missing the skin. All go into the trash. Don’t skip this step! Can’t tell you how many times I’ve found tiny rocks in the dried beans. Yes, this is a rock I found in my bag of beans. From here, you must wash, rinse, repeat. Again, don’t skip this step, or your beans will taste like dirt. Ewwww! Not sure about you, but I don’t like to eat dirt. Well, not since I was 2-years-old at least. lol. 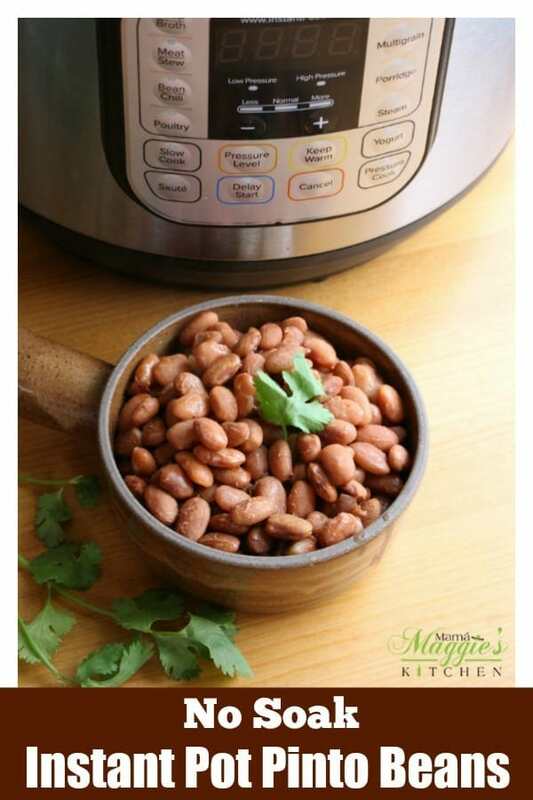 Place your beans in the Instant Pot. Add salt. 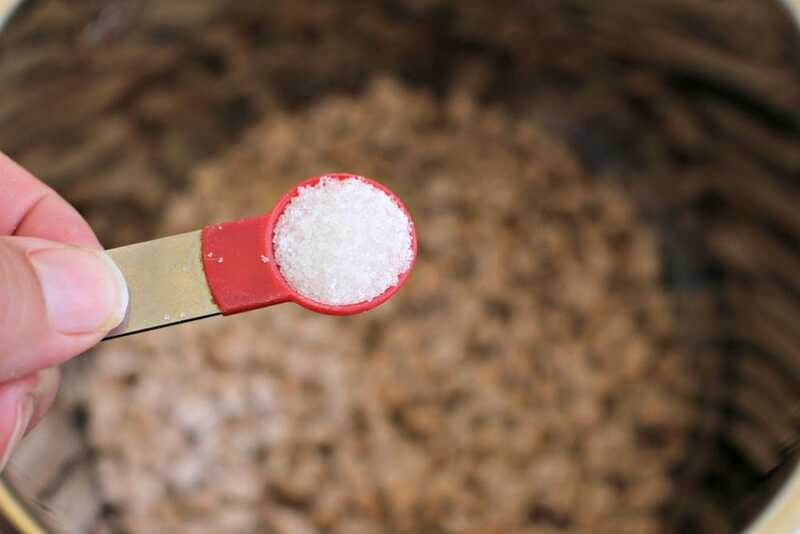 Typically, we use a lot of salt, but because we’re using an Instant Pot and less water, use less salt. I recommend 1 teaspoon for 8 cups of water. Oil… I know. I know. Totally not traditional, but it helps with the foaming and prevents clogging up the pressure valve. 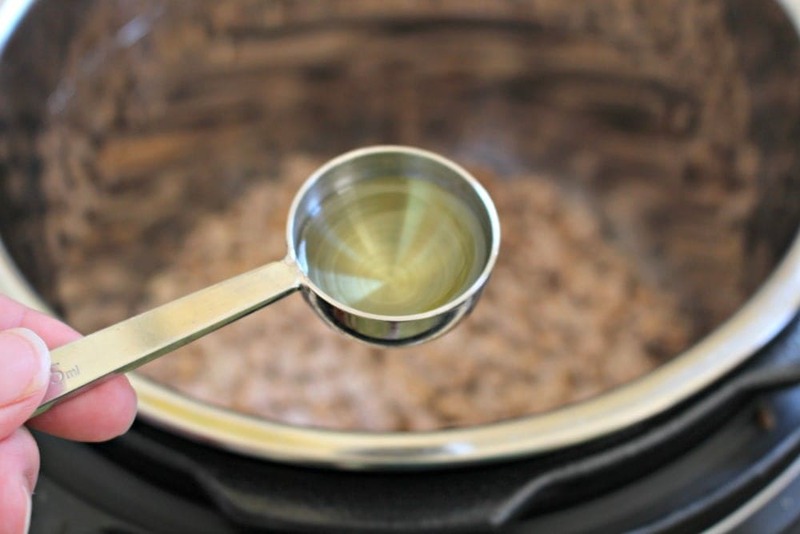 Add the water and lock the lid on your Instant Pot. Lastly, CAREFULLY open up the lid, and your beans are ready. 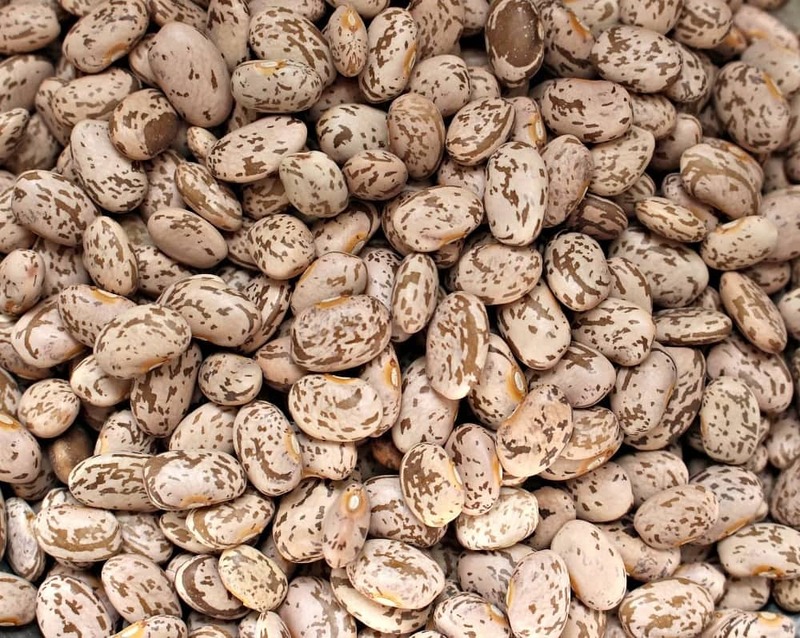 There will be more cracked beans than pinto beans cooked on the stovetop or in the slow cooker. They are also more mushy, but if you’re making yummy and creamy refried beans or sticking them in a soup, this isn’t a problem. Full natural release is better than quick release. It will help prevent all of the above. The only problem that I found with the NO SOAK method: The beans are not as plump. 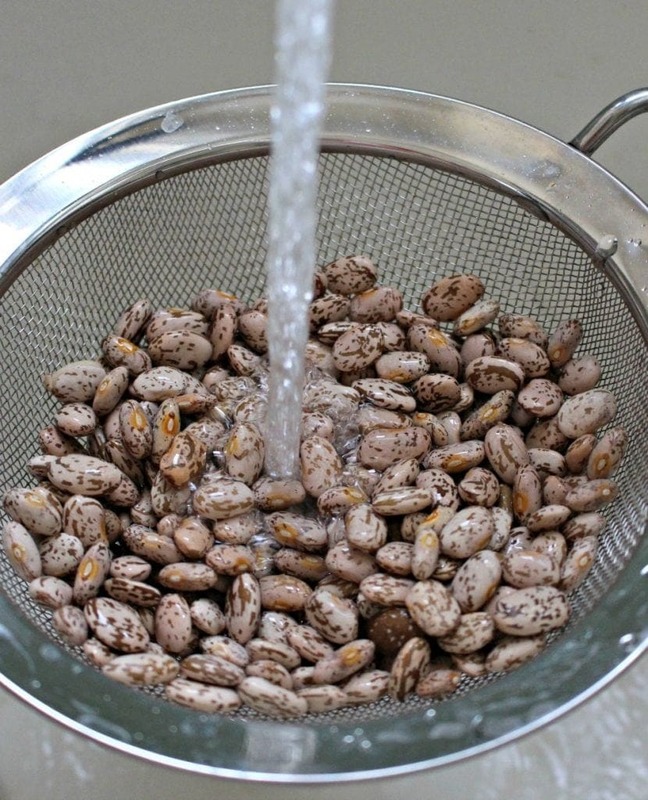 Soaking allows the beans to absorb the water and get nice a fat. 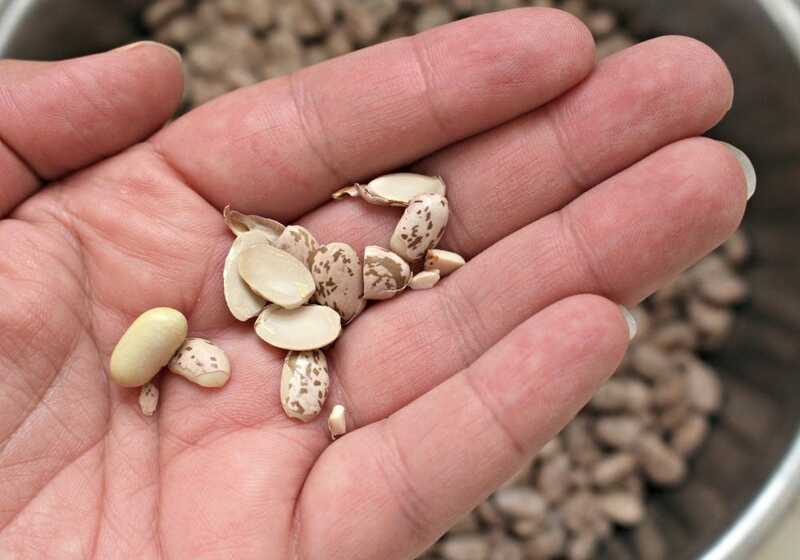 If you decide to not soak the beans, know that they will be smaller. Some people say that soaked beans help with digestion, and you won’t have so many tummy issues. I’ve never experienced this firsthand. 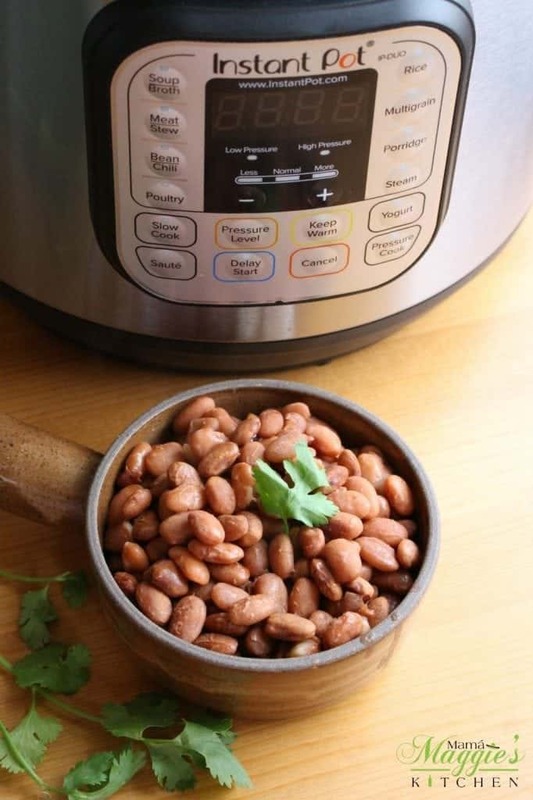 With an Instant Pot, you can only add so much liquid in order for the beans to cook properly. That’s why you can’t make a big pot of beans. Instead, I recommend to cook in batches. If they are not cooked thoroughly… yes, it can happen… lock the lid back on the Instant Pot, set pressure cooker HIGH, 5 minutes. The pot will go back up to pressure quicker because it’s still hot. 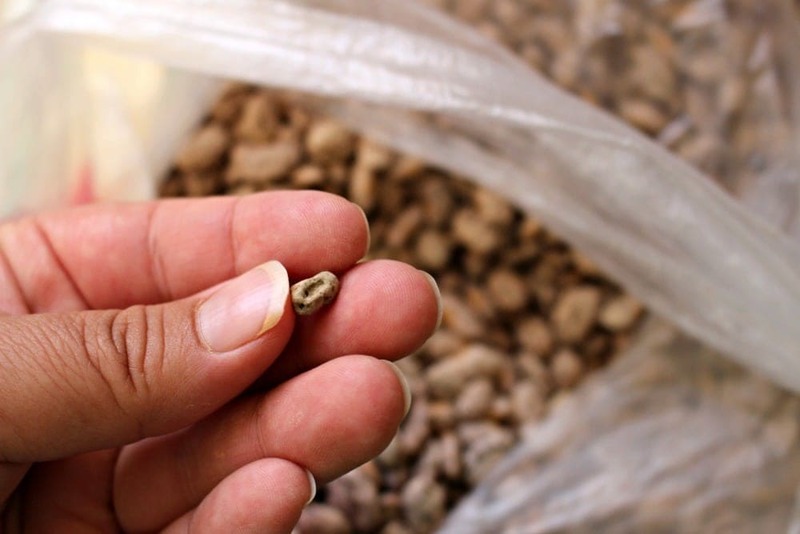 Then carefully test the beans if ready. Hope you enjoy! 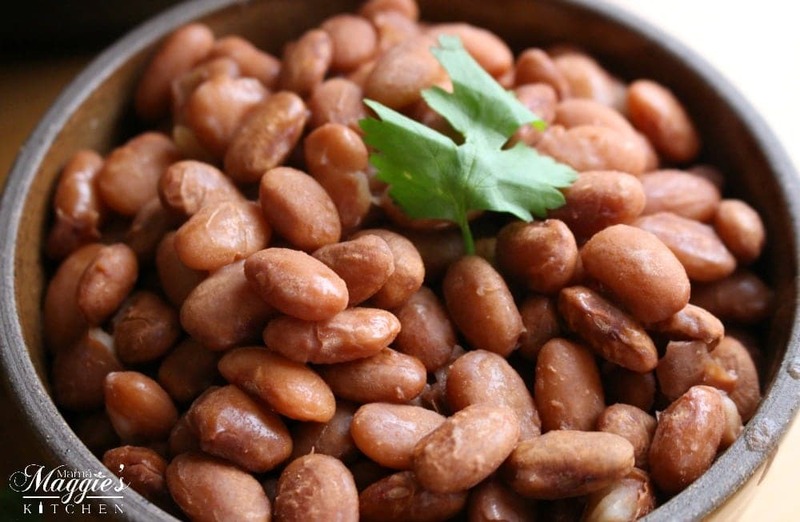 See my original recipe for Frijoles de la Olla, or Cooked Pinto Beans. Sort beans, removing all broken beans. Wash and rinse several times, removing all the dirt. Add the water, salt, and oil. 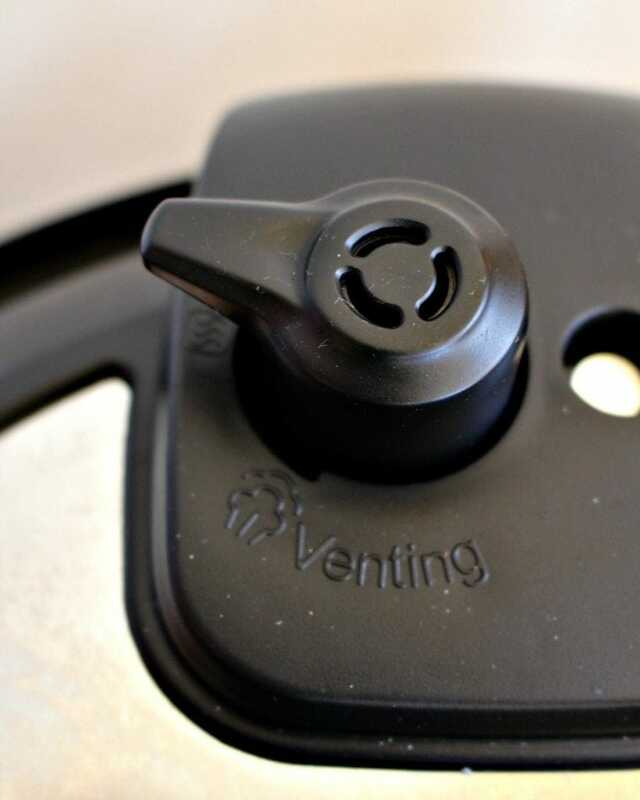 Seal the Instant Pot lid and set the steam valve to "Sealing." Set to high pressure for 35 minutes. When the cycle ends, allow for the full natural release. Move the switch valve to “Venting.” Allow all the steam to release before opening. 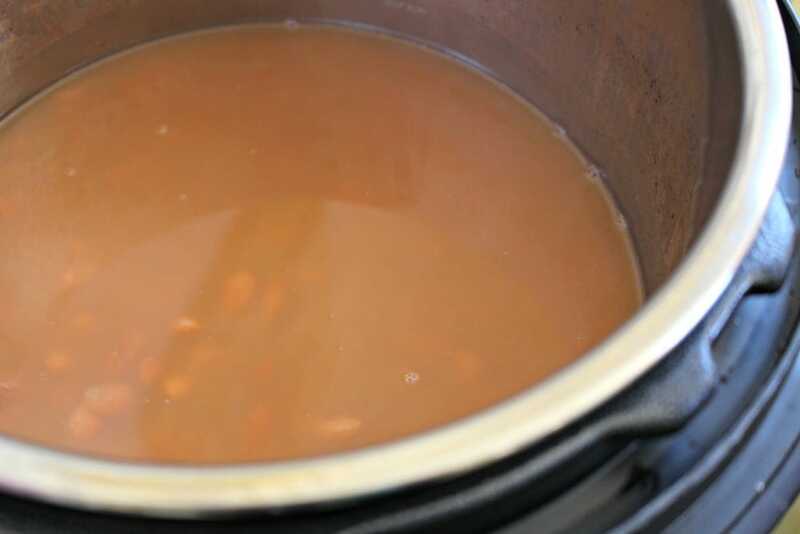 Note: If the beans are not fully cooked, return to the Instant Pot and set on high pressure for 5 minutes. 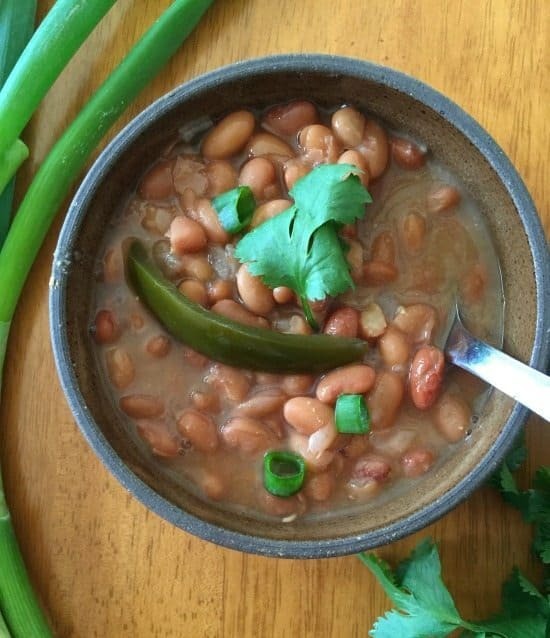 I absolutely love pinto beans so I need to try out this recipe. Now all I need is an Instant Pot! You made it look so easy to do!! I love Pinto Beans!! Yum these look amazing, and super easy to make! this sounds amazing but I dont have an insta pot! They scare me. However, I am a huge fan of all beans. Yum! Those beans turned out perfectly! This is yet another compelling reason for me to consider getting the Instant Pot. I don’t have one yet! Do you have avocado trees in Coronado? If you do, steal some leaves and put one or two in your beans to cook. That’s the way Lidia cooked black beans in Boca del Cielo, Chiapas. Divine! I’ve seen many recipes with avocado leaves. Unfortunately, it’s not very popular ingredient and hard to find in the US. Just like you said, though, if you have a tree, pick one of the leaves and add it to the pot. Thank you for suggestion! This doesn’t belong here but I have to ask: where is your stewed chickpeas recipe? I saw it two days ago, but I can’t find it, and I have a huge pot of chickpeas. I don’t have a recipe for stewed chickpeas… lol. Maybe one day!